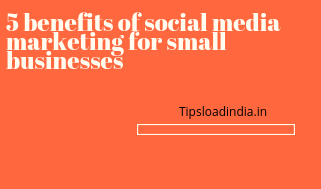 Small business need cost effective publicity to increase their sales so social media marketing can help small businesses in this failed in this article I will explain five cool benefits of social media marketing for small businesses. Choose these Social media websites to marketing for small businesses. Social media marketing provides a very low cost publicity of products for small businesses, this is just according to requirement of small business. This is a very big benefit of social media for small businesses because they can advertise in all over the world with minimal spendings if we compare the prices and the cost of advertising on social media networks then we find a dramatic result that this is very low in the comparison of other advertiser. Small business need a lot of customer to grow their earnings so social media marketing can provide them customers from all around the globe because social media is equally popular in all countries so if small businesses use social media marketing then they can increase their skills and expand their business in several countries currently several companies are using social media marketing to go there small business and social media marketing is helping them. When small businesses you social media marketing for advertisement and publicity then this gave them high quality customers with high value orders, ads on the social media platforms attract more visitors to click and small business can grow their sales by social media marketing. This is the biggest benefit of using social media marketing tips for small businesses. Small businesses can choose their target country for advertise for example you are doing your business in a country of Asia and you want customers form Europe then you can advertise only in Europe to get customer form their and social media marketing can help you to do this work with cost effective way. There are a lot of advertising networks are available on the web who are pretending to be the best advertiser on the internet but most of them are fraud they don't give you any benefit they will only charge you big amount and don't give you anything in return they used machines to show your ads so this is very important to choose the right way to advertise and social media marketing is a genuine way to advertise on the web because social media will provide you only original customers and genuine Impressions for your product you can trust on social media marketing with big social media websites like you can use Facebook Twitter and Instagram you can also use YouTube to increase your small business sales.